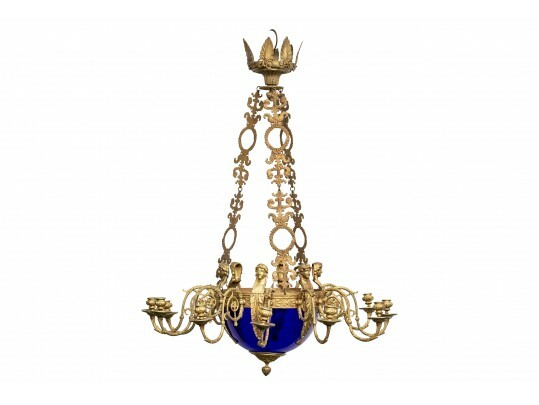 The center cobalt glass dome mounted with repetitive classical figural head mounts and scrolled arms supporting 12 lights having scalloped cobalt glass bobeches. The acanthus leaf canopy crown suspended by 3 pierced Napoleonic wreath decorated chains. Condition: central cobalt glass dome broken under bronze lower central terminal with 3” crack. Minor chips to a few boboches.